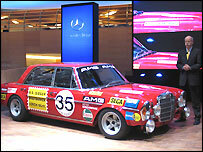 Muscle cars took centre stage as DaimlerChrysler boss Dieter Zetsche roared onto the stage at the Geneva motor show in an Mercedes 300 SEL racing car. "What a beast of a ride," the executive enthused as he stepped out of the fuming car - which had won the Spa 24-hour race in 1971 - before declaring that "thanks to its success on the track, I first came to know AMG". Twenty-five years on, he is glad he did, not least since the in-house Mercedes supercar division AMG, which has long been on the fringes of the car maker's operations, is about to step into the limelight. "Ladies and gentlemen, AMG stands for performance, individuality and luxury; AMG's powerpacks are the stuff of which dreams are made of," declared Mr Zetsche, who is also personally heading up the DaimlerChrysler subsidiary Mercedes Car Group. There seems to be commercial logic, therefore, behind Mercedes' decision to unveil no less than five new AMG supercars at the show, which opens for the public on Thursday this week. On offer there is a large luxury saloon for executives in a hurry, alongside a grand tourer for groups of executives in a hurry. These models are flanked by smaller but equally powerful roadsters, coupes and convertibles - one of which was driven onto stage by AMG's head Volker Mornhinweg. "This is the future sound of AMG," Mr Mornhinweg called out over the roar of the engine. But his show was soon spoilt by the arrival of Mr Zetsche who, having left the podium earlier, had popped backstage only to return riding a silver bicycle. 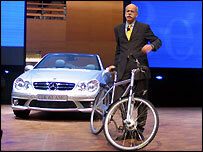 "But we respect the fact that others believe that this bike is all the mobility you need," Mr Zetsche declared, in a seemingly vain attempt at apologizing for his company's outrageous display of brute force. 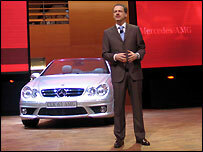 Mr Zetsche was keen to stress Mercedes' green credentials, or in this case, blue. "Most of our customers want cars, of course, the kind of cars that combine driving pleasure with environmental compatibility," he said, insisting that "even full-sized sports utility vehicles (SUVs) can be clean and economical". The secret behind such a bold statement is Mercedes' new Bluetec technology, which Mr Zetsche described as "the world's cleanest diesel". Initially, the technology will be used in the GL320 SUV, which will go on sale in the US in September, and which Mr Zetsche insisted "achieves a fuel consumption that is 20-40% lower than that of any other full-size SUV in the US". In Europe the technology should be available on cars by 2008, Mr Zetsche said, insisting that "in Bluetec, Mercedes-Benz has developed a compelling alternative to the hybrid engine". But investors are generally more interested in the greenback than in green technology, and wonder whether recently appointed Mr Zetsche is himself powerful enough to sort out Mercedes and its sister companies within the DaimlerChrysler group. The group clocked up a 15% rise in net profits last year to 2.85bn ($3.4bn), but its sales rose just 2.7% to 4.8 million cars, leaving some analysts worried about whether the company can turn itself around in a tough market. "DaimlerChrysler's disappointing fourth quarter results and 2006 outlook is a reminder that even powerful new management cannot control the competitive environment," according to a recent Morgan Stanley analysis. But they can do much to control costs, so in January DaimlerChrysler said it would cut 6,000 management jobs and reduce the number of board members from 12 to nine as part of efforts to cut expenses by 1.5bn euros a year. The job cuts from its 385,000-strong workforce, which will come along with a move of the company's headquarters closer to its factories, will come on top of 8,500 jobs lost last year. DaimlerChrysler's cost cutting efforts are met with some resistance from unionised workers, however, so industry experts are not convinced Mr Zetsche will enjoy a smooth ride going forward.